Lock in a great price for Holiday Inn Express Hunt Valley – rated 8.5 by recent guests! Like the room settings, Bed, shower, space, Mini fridge. The location met my needs. The cleanliness of the room. Breakfast: Excellent; Bathroom: Sink was clogged when I arrived, and did not improve by the time I left. I checked out on a holiday; your housekeeping staff was lugging heavy bags of linen. A more conscientious manager/owner would have provided staff with a cart/trolley/wheeled device to ease their job. I noticed this since I was a shop steward, always on lookout for colleagues' safety. It was a neat, clean and orderly property from the great parking to the lobby to the room!! Very clean and great breakfast with eggs, home fries, sausage n biscuits, pancakes, cinnamon rolls and these are just a few of the great choices. Close to my con ference. The price was reasonable. Breakfast was decent. Room was clean. Front desk staff were friendly. Breakfast was as expected. The staff was very friendly, even maintenance workers would say hello, hold the door for you, etc. The breakfast buffet was excellent- a lot of choices, all very tasty and even on very busy mornings you never had to wait for them to bring out more food. A very nice place for a couple night stay. Close to Light Rail was reason for staying and inexpensive and out of Baltimore city. Wegmans is real close also! Holiday Inn Express Hunt Valley This rating is a reflection of how the property compares to the industry standard when it comes to price, facilities and services available. It's based on a self-evaluation by the property. Use this rating to help choose your stay! One of our best sellers in Hunt Valley! Located nearby Interstate 83, this Hunt Valley hotel offers free Wi-Fi and rooms equipped with a microwave and refrigerator. Cranbrook Shopping Center is 2 miles away. 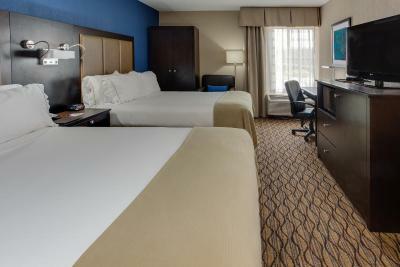 A flat-screen TV is offered in each traditionally decorated room at Holiday Inn Express Hunt Valley. A work desk is also included. A continental breakfast is served each morning and it features hot coffee or tea along with fresh fruit and pastries. Guests can work out in the on-site fitness center. A business center that offers fax and photocopying services is also available. The Hunt Valley Holiday Inn Express is 6 miles from Oregon Ridge Park. Baltimore city center is 17 miles away. When would you like to stay at Holiday Inn Express Hunt Valley? This room features a double bed, complementary wireless internet, flat-screen TV with cable channels, microwave, refrigerator, work desk, alarm clock, radio, coffee maker, hair dryer, coffee maker, iron and ironing board, and telephone. This room features a king bed, pull-out sofa bed, complementary wireless internet, flat-screen TV with cable channels, microwave, refrigerator, work desk, alarm clock, radio, coffee maker, hair dryer, coffee maker, iron and ironing board, and telephone. This room features a king bed, complementary wireless internet, flat-screen TV with cable channels, microwave, refrigerator, work desk, alarm clock, radio, coffee maker, hair dryer, coffee maker, iron and ironing board, and telephone. This room features two double beds, complementary wireless internet, flat-screen TV with cable channels, microwave, refrigerator, work desk, alarm clock, radio, coffee maker, hair dryer, coffee maker, iron and ironing board, and telephone. This hearing accessible room features a king bed, roll-in shower, complementary wireless internet, flat-screen TV with cable channels, microwave, refrigerator, work desk, alarm clock, radio, coffee maker, hair dryer, coffee maker, iron and ironing board, and telephone. This disability accessible room features a king bed, wheelchair accessible tub, complementary wireless internet, flat-screen TV with cable channels, microwave, refrigerator, work desk, alarm clock, radio, coffee maker, hair dryer, coffee maker, iron and ironing board, and telephone. This hearing accessible room features a king bed, complementary wireless internet, flat-screen TV with cable channels, microwave, refrigerator, work desk, alarm clock, radio, coffee maker, hair dryer, coffee maker, iron and ironing board, and telephone. This hearing accessible room features two double beds, complementary wireless internet, flat-screen TV with cable channels, microwave, refrigerator, work desk, alarm clock, radio, coffee maker, hair dryer, coffee maker, iron and ironing board, and telephone. This disability accessible room features two double beds, wheelchair accessible tub, complementary wireless internet, flat-screen TV with cable channels, microwave, refrigerator, work desk, alarm clock, radio, coffee maker, hair dryer, coffee maker, iron and ironing board, and telephone. House Rules Holiday Inn Express Hunt Valley takes special requests – add in the next step! Holiday Inn Express Hunt Valley accepts these cards and reserves the right to temporarily hold an amount prior to arrival. My daughter got a tremendous amount of BEDBUG bites. It was awfull. I didn’t stay for the entire reservation left the premises after one night. The vanity is very small. If more than one person, there would be no room for toiletries. The TV reception was bad--picture would freeze and no signal would be displayed on screen. Thankfully, I was not interested in watching TV. The room faced York Road. Beginning at 6 am there was a lot of street noise. I had requested my reservation a room that DID NOT face York Road. Bed was comfortable. Breakfast was very good. Location and how clean it was. Personnel, friendly & courteous, room comfortable & clean. Very nice breakfast area and the choices of food was excellent. There wasn't anything I didn't care for, didn't use the WiFi or fitness center so I can't comment on them. Air conditioning unit made a lot of noise and appeared to be broken as the carpet was flooded near the window. However when reported was offered another room which I declined because it wasn’t that cold so turned off the unit and someone would be around to fix it the next day which they did and noise and leaking stopped then. Breakfast was good enjoyed it throughly, staff were very helpful and supportive when I struck a deer on road, calling the police and allowing me to call my wife in Canada. I bugged them a number of times for issues with my card no longer working in my room apparently it was too close to my phone and it disrupted the signal on the card. This is my own fault and they were very patient and nice about it.